Forget bears, forget thunderstorms, forget things that go bump in the night: the real terror on the Appalachian Trail is the size of a sesame seed—or smaller. The eastern deer tick (ixodes scapularis, or the “blacklegged tick”) is notoriously difficult to spot due to its minuscule size, its resemblance to a speck of dirt, and its tendency to hide on parts of your body that are hard to reach and/or see, such as under the edges of clothing or between creases in your skin. As a parasite, the tick burrows its head into the skin of a host animal and feeds off of the blood. Over time, the tick’s body becomes larger, engorged from the collected host blood in its abdomen. Once full, the tick releases from the host body and slowly digests the blood, either advancing to its next life stage or preparing to produce young. And thus the disgusting, blood-sucking circle of life begins anew. Deer ticks live along the entire length of the AT, yet they are most active in the New England region. 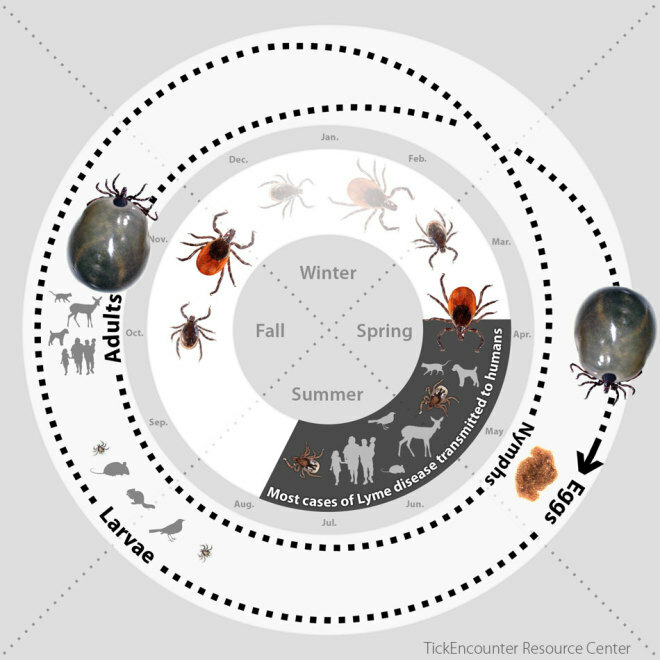 Deer ticks have three life stages: the larva stage, when ticks have just emerged from their eggs; the nymph, or “teenager” stage where the ticks are still growing; and the adult stage, the grand finale before the ticks lay their eggs and shuffle off to tick heaven (which is probably pretty close to dog heaven). Nymph deer ticks are particularly active between May and September, the window of time when most thru-hikers pass through the region. Yet the main problem isn’t the creep-out factor, but rather the fact that 50% of adult deer ticks (and 25% of the tiny nymphs) carry a bacterium called Borrelia burgdorferi, a nasty little germ that causes Lyme disease. While the deer tick is the only known animal that can transmit Lyme disease to humans, it isn’t actually born with Borrelia burgdorferi already in its system; rather, a deer tick contracts the bacterium when it feeds on a host that is already infected. Referred to as “Lyme disease reservoirs,” some of the most common host animals carrying Lyme disease include—you guessed it—deer, as well as white-footed mice. The mice are actually a deer tick’s preferred host, as they are constantly shuffling through the underbrush close to the ground. And of course, they then shuffle into the shelters where thru-hikers will likely be spending much of their time. While rarely—if ever—capable of killing you, Lyme disease is a potentially life-long infection affecting your skin, joints, nervous system, and occasionally your heart. There are three stages of the disease, each with its own set of symptoms. During stage one—which occurs roughly 1-4 weeks after an infected tick has bitten you—the most common symptom is a bull’s-eye shaped rash that slowly expands from the site of the tick bite. The rash typically doesn’t cause pain or itchiness, meaning you likely won’t notice it unless you or someone else sees it. Further symptoms might include constant headaches, neck stiffness, muscle and joint pain, low-to-medium grade fevers accompanied by chills, severe exhaustion, and swollen lymph nodes. Stage two is where things start to get really serious. Taking place 1-4 months after infection, the bulls-eye rash may start appearing on other parts of your body as the disease spreads. You may experience pain, weakness, or even numbness in your arms and legs as the disease reaches your nervous system—you could even lose control of your face muscles. On top of the headaches that started in stage one, you may begin to experience poor memory and have difficulty concentrating. Muscle and joint pain continues and intensifies, usually culminating in painful swelling in your knees. You might also develop pinkeye, or damage to the deep tissue in your eyes. Finally, occasional bouts of rapid heartbeats aren’t uncommon; in rare cases, more serious cardiac problems may arise. In the final stage, several months after initial infection, symptoms increase in severity and may become permanent. These include arthritis (typically in your knees and other major joints); tingling and numbness in your hands, back, and feet; a constant feeling of exhaustion; lack of control of your face muscles; increasing difficulty with memory, mood, sleep, and occasionally with speaking; and intermittent inflammation of the areas surrounding your heart. Some of these conditions will go away over time; others will stay with you for the rest of your life. In other words, you absolutely do not want Lyme disease to progress to the later stages. 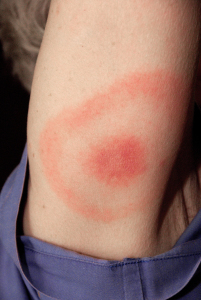 If caught early, Lyme disease can usually be cured with aggressive antibiotics. If left untreated, however, some of these problems may show up years later and never go away. And here’s where the real problem lies: sometimes these symptoms do not appear until the disease has already progressed to the final stage. You may never see that bull’s-eye rash or develop a fever. Instead, years after that one encounter with a tiny little tick, you may wake up with full-blown Lyme disease. Still want to take a walk in the woods? Before you decide to lock yourself indoors for the rest of your life, keep in mind that it is rare to have absolutely no symptoms. In fact, most people who advance to the later stages of Lyme disease typically don’t realize that they have been infected. How many hikers suffer from sore joints and fatigue? All of them, right? Yet if you’re more sore or tired than usual for several days, to the point where it’s an constant struggle to get up and force yourself to hike, it might be a good idea to stop by a clinic as soon as possible. Having a fever, chills, and stiffness are symptoms remarkably close to those that accompany the flu—which, let’s face it, you should be going into the doctor about anyway, but could be another indication of Lyme disease infection. It’s way too easy to push some of these symptoms aside as just part of a thru-hike, when any of them could actually be pointing to something far more serious. In short, if you are thru-hiking and start experiencing any of the symptoms listed above, inform your doctor that you have been walking through an area where you may have come into contact with deer ticks. Of the thru-hikers I knew who thought they had contracted Lyme disease, 100% of them received the appropriate antibiotics from a doctor even before their test results had come back. Time is always the most important factor in the severity of Lyme disease, so doctors are typically willing to provide medication as a precaution. As long as you’re aware of the symptoms and, more importantly, you know when and where a tick has attached to you, you can more accurately monitor your well-being and inform a doctor that you have been potentially exposed to Lyme disease. Unfortunately, there currently is not a Lyme disease vaccine available for humans, though there was one roughly a decade ago. The vaccine was made available in the United States in 1998, but after many people made (mostly unsubstantiated) claims that the vaccine caused Lyme arthritis in users—which resulted in several lawsuits, a heap of bad press, and poor sales numbers—the vaccine was pulled from the market just a few years later. It was recently announced that a new experimental vaccine shows promise for full development, though it is still likely years of clinical trials away from getting into the hands of consumers. So for the time being, you’ll need to use external methods to prevent Borrelia burgdorferi from entering your body in the first place. There are two popular chemical treatments that may help you ward off deer ticks: DEET and permethrin. If you’re on this site, chances are that you have caught a whiff of eau-de-DEET at some point in your life: its distinctive smell can be found wafting from the majority of insect repellents on the market today. DEET works by disrupting the sensors on insect antennae, making it very difficult or impossible for them to detect body heat and other indicators that may attract them to you. In other words, if a deer tick latches onto you and is exposed to DEET, it may not know that it has found a host and drop off. Frankly, knowing how bad DEET smells, the ticks may just run away out of pure disgust—much like day hikers run away when they’ve caught a whiff of a thru-hiker’s signature odor. DEET and permethrine are probably the two most effective chemical deterrents in regards to deer ticks. 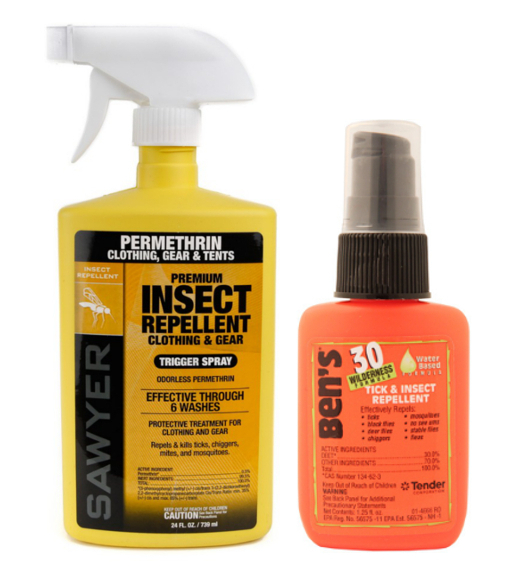 Where DEET is a repellent, permethrin is a full-on insecticide. This means that any tick (or pretty much any other six-to-eight legged creature) that comes into contact with it will need to be fitted for a tiny coffin. Seeing as permethrin is a poison, it is highly inadvisable to apply it directly to your skin for extended periods of time. Instead, permethrin should typically be applied to clothes, boots, gaiters, tents, and backpacks. There are permethrin sprays and washes for these items, and they typically last for around six week or six trips through the washing machine, whichever comes first. Yet before you take a permethrin bath and douse yourself with DEET, be aware that there are a boatload of side-effects that are possibly linked to both of these chemicals. Some studies have shown that extended permethrin exposure has been associated with increased risk of various cancers, as well as being extremely toxic to cats and fish. DEET has been linked to eye and skin damage, some short-term psychological issues, and birth defects when used (excessively) by pregnant women. However, the risk of these side effects occurring is relatively low, especially if you follow the directions printed on the product packaging. Also, it’s recommended that you don’t use a product that is over 30% DEET, as DEET absorbs into your skin—the higher the concentration, the higher the chance of negative side effects. One other piece of advice: don’t spray DEET on or around things made of plastic, as they will melt. My watch found that out the hard way. For deer ticks to actually penetrate your skin, they have to be in direct contact with your skin—they don’t have a mosquito-like proboscis that allows them to bite you through clothing fibers. Thus, when going through high-risk areas, it’s a good idea to wear light colored clothing so it’s easy to see deer ticks that have latched onto you. For the best results, it’s also recommended that you wear a long-sleeved shirt tucked into your pants, full-length pants tucked into your socks, and enclosed shoes. This system helps prevent ticks from crawling between layers and hiding under the edges of your clothes. It’s essentially a turtle shell of protection, keeping the nasties from penetrating your precious epidermis. 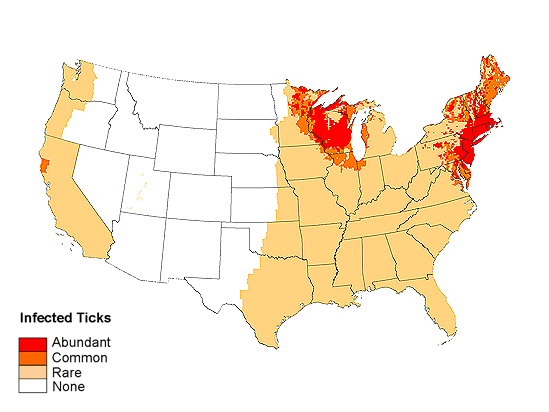 A map of the USA highlighting the areas where you are most likely to encounter an infected deer tick. Photo courtesy of the American Lyme Disease Foundation. But let’s face it: every day on the AT isn’t a nice, cool stroll through perfect weather conditions where sealing yourself in layers of clothes will feel wonderful. No, you are going to be sweating like it’s your first date with a supermodel—not only will you traverse some of the most physically demanding terrain in the United States, you’re probably going to experience a long string of days where the temperature is consistently above 90 degrees Fahrenheit. In other words, you’re going to suffocate from the heat if you’re bundled up in layers of tick protection. Yet if you trade in those long pants for some shorts, that line of defense is gone entirely. While I definitely admit that it’s not the easiest thing to do when the nearest shower is several days away, there’s still no excuse to ignore something that, in the long run, may end up saving your hike. As you’ll almost always be camping next to a water source, use a bandana or towel to wash all of the dirt, leaves, and mud from your legs—I had a total of four deer ticks latched onto me over the course of my thru-hike, and I nearly missed all of them because they blended in with the surrounding filth. When you can, ask a fellow hiker to look at your back to see if you have any hitchhikers under your shirt. Check the back of your legs and arms, and always find a few private moments every day to inspect the most likely places for ticks to hide: the parts of you that are always warm and provide plenty of hiding places. Always search underneath the edges of your clothing, especially the tops of your socks. If you can, keep your hair relatively short so that ticks have fewer places to hide—it’s easier to find a needle in a haystack than in an entire wheat field. Lastly, after going through particularly high grass or brush, take a few seconds to give your legs and boots the once-over, as this is when ticks will have just jumped onto you and will likely be scampering for cover. Also, keep your eyes open at the Lehigh Gap Superfund site in Pennsylvania. That place is a nightmare full of ticks. Remember, not all deer ticks carry Lyme disease, and if one has been attached to you for less than 36 hours, your chances of the Borrelia burgdorferi bacterium having been transmitted are practically zero. This is why daily tick checks are so important. Should you find a tick, don’t just scratch it off, as the head may break off and remain attached to your skin. Instead, use a pair of tweezers to get as close to the tick’s attach point as possible and pull firmly away from your skin. This should pull out every piece of the tick, which you can then dispose of—preferably with extreme prejudice. Maximizing your chances of avoiding Lyme disease basically comes down to this: pay close attention to your body when tick season starts, particularly in New England. You may be one of the unlucky ones who has a run-in with the tiny terrors of the woods, but if you’re watching out for yourself, you have a much smaller risk of catching a disease that, for many, ends up crushing their thru-hiking dream. At the very least, if you know the symptoms you should be looking for, you may be able to catch the infection before it becomes a permanent part of your life. Not in any manner do I mean to condemn your information at all. I would like to add to and suggest further research on your Lymes Disease information. Lymes is found in every state the AT is in. I would also like to point out that the bulls eye rash shows up in around 40% of the cases. As well less that 50% will test positive and have the disease. I am a Lymes Disease patient have been for almost 4 years now. I caught it in Cherokee County Georgia. There are at least 300 strains of the disease, some of them no worse than the flu and your own body will cure them. I personally have a more severe strain yet I still test negative. The disease shows up on an MRI of my brain. Many doctors still believe the disease is only in certain states and that is why I am sharing this with you. 5 weeks after being bitten I told my doctors that I had Lymes Disease because of my avid love for hiking and camping. I have always stayed informed with the symptoms of Rocky Mountain Spotted Fever as well as Lymes. Some of the top infectious Disease experts in Georgia refused to believe it was here in Georgia. I was not correctly diagnosed until 3rd stage and permanent damage. Hope this helps someone but don’t let it make you stop living. I still hope I may be able to hike those mountains one more time some day!